Eastern redcedar (Juniperus virginiana L.) is one of widely distributed species in Oklahoma. Current area covered by Eastern redcedar in Oklahoma is estimated beyond 4.5 million hectares and it is projected to be more than 6.3 million hectares within next 10 years. It is claimed that as an invasive species, it is growing at the rate of 380 hectares per day resulting in a significant adverse impact on ecological balance. Eastern redcedar is encroaching in the Great Plains and one of the most predominant woody species in the United States. As an invasive species, it quickly replaces the native grasslands, adversely influencing the diversity of native plants, birds and small mammals. Therefore, the encroachment of Eastern redcedar has created severe negative impact on the ecosystem, including the loss of native plants and animals, reduction of forage production and livestock handling, impacts on soil hydraulic properties and increased risk of wildfires. Average annual economic loss in terms of catastrophic wildfire, loss of cattle forage, loss of wildlife habitat, recreation and water yield was as much as $218 million in 2001. Generally, trees are relatively in low value due to their irregular growth pattern; therefore, lumber manufacture from Eastern redcedar is limited to those trees with larger diameter. However, such trees still can be used to manufacture different products, including indoor and outdoor furniture units, paneling, novelty items, mulch and even composite panels. Different types of experimental particleboard, waferboard and sandwich type of panels have been manufactured in previous studies. It was determined both physical and mechanical properties of such panel products were comparable to those manufactured from different species at commercial scale. 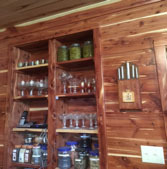 Currently, there are around two dozen small- and mid-size manufacturers using Eastern redcedar as a raw material to produce various end products ranging from lumber to small novely items in Oklahoma. Singing Wire Sawmill is one of the manufacturers located in Beggs, Oklahoma. 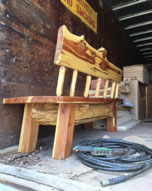 Perry McDonald, who is the owner of the company, is running a portable sawmill using Eastern redcedar and other underutilized tree species to manufacture not only lumber but also cabinet, paneling and furniture units. Singing Wire Sawmill is a small-size wood products facility having several employees using underutilized Eastern redcedar trees harvested in the area as raw material. The company has a portable sawmill, small-size drykiln, along with a fully equipped woodshop. Sawn lumbers are initially airdried by stacking under a shed up to 20 percent moisture content to be used for outdoor furniture manufacture. Material to be used for indoor furniture and cabinet production is dried in a kiln to a target moisture content of 7 to 8 percent. Singling Wire Sawmill is the only one in Beggs area converting low-quality redcedar trees into value-added products, as illustrated in Figures 1, 2 and 3. Figure 1. 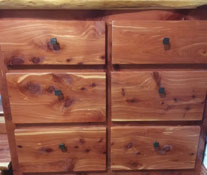 Eastern redcedar chest. Figure 2. 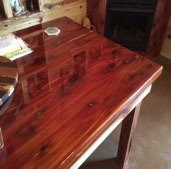 Eastern redcedar furniture. Figure 3. Outdoor furniture made from Eastern redcedar.